An uber-cold and sporadically rainy day. I moved my work days around to spend two days helping M with the shed. It was definitely a two-person job! He had spent quite a while cutting all the side supports and roof trusses in half and welding in extra bits to increase the height and width respectively. He then had to re-dig all the holes (remember the saga? ), pour concrete in them all and mount bolty things in the concrete. (Here’s where I come in…) We had to bolt all the side supports into position in preparation for the roof trusses to be hoisted up on a crane and in turn be bolted to the side supports. 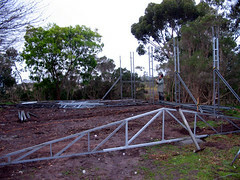 Getting the side supports on to the bolty thing was one thing – getting the side supports level was another. Big thanks to our friend Spirit Level and to the little stainless steel washers we used as chocks to get them level.